Heroin has several ingredients but it has 2 ingredients that are the most important ones, without it heroin cannot be made. These 2 ingredients are known as "Morphine" and "Acetic Anhydride". 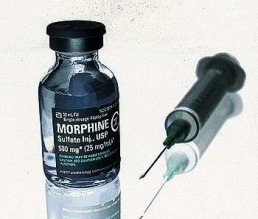 Morphine is known as a narcotic. A narcotic is a type of drug used as a pain releiver in several ways, such as if you get your leg cut off or you are getting operated etc. Acetic anhydride is a chemical compound.